As plans for further housing comes forward, Harworth Estates has submitted amendments to the masterplan for the £100m Waverley development in Rotherham that could see proposed local centre moved to an area previously zoned for commercial development. 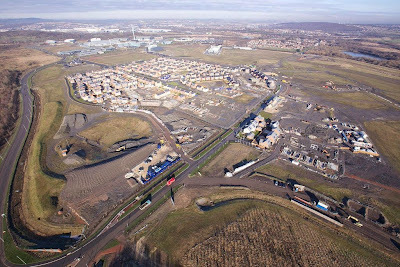 Approved in 2010, the largest, most complex, planning application ever considered by Rotherham Council gave outline approval for South Yorkshire's largest ever brownfield development, creating a new 3,890 home community across 741 acres. The development is also set to have a hotel and a local centre with a wide range of shops, cafés, health, leisure and educational facilities. Harworth Estates, the company created to realise the property assets of what was UK Coal, applied last year to vary a number of conditions of a follow up application, approved in 2013, to allow development to continue on the site. Housebuilding began in 2012 on the first of the planned phases in character areas called Highfield Spring and Highfield Place, across from the expanding Advanced Manufacturing Park (AMP). Building on the Waverley Central area is now coming forward earlier than anticipated. Since July 2014 Harworth Estates has entered into a dialogue with Rotherham Council to discuss the possible relocation of the local centre from its current location north of the current residential developments to sit between the AMP and residential areas, land previously known as Highfield Commercial where the AMRC Training Centre is located. The latest plans, drawn up by consultants, Barton Willmore, state that: "Whilst no plans have been formally approved as yet, the relocation proposals and discussions have been progressed to a stage that associated land uses/phases should take account of the potential implications." Helical Bar plc, Governetz Ltd and Harworth Estates worked together with the intention to provide high specification offices for government departments on the Highfield Commercial land at Waverley. 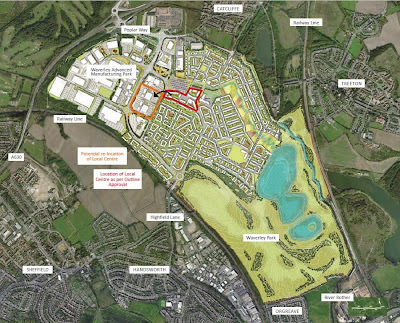 Outline plans for a 60,000 sq m development, enough space for 2,000 staff, were approved but changes in government and large scale cuts meant that the plans were shelved. If the local centre is relocated, the blocks of the location originally proposed could then be converted to residential. The plans also outline the design for Waverley Walk, the key route from the AMP and local centre through the residential area to the waterfront. As houses and commercial premises continue to be built at pace, Harworth has stated that it would apply for detailed planning consent for the new district centre containing shops and local facilities in 2015, with construction expected to start in 2016. Also submitted this week are plans for 66 further dwellings that are set to be built by Harron Homes. The proposals incorporate a mixture of two, three, four and five bedroom properties, including affordable homes, set to be built on two parcels of land, one to the north (31 dwellings) and one to the east (35 dwellings) of the current development. The progress in 2014 has brought the total sales since 2010 to approximately £46.1m, with a current valuation of the residual holding by the Harworth Estates Group of approximately £40.8m. Away from Waverley, where Harworth Estates also has its offices, the company has acquired the site of the former Lynemouth aluminium smelter near Newcastle-upon-Tyne from Rio Tinto. The acquisition of the site is Harworth's second major non-coalfield acquisition and adds to its large portfolio of UK regeneration sites which has a value of £290m.